Yesterday I had a little time after work to tackle some of the mess in the yard from the wind storm we had last Sunday night. There are leaves everywhere. This is one of my gardens. 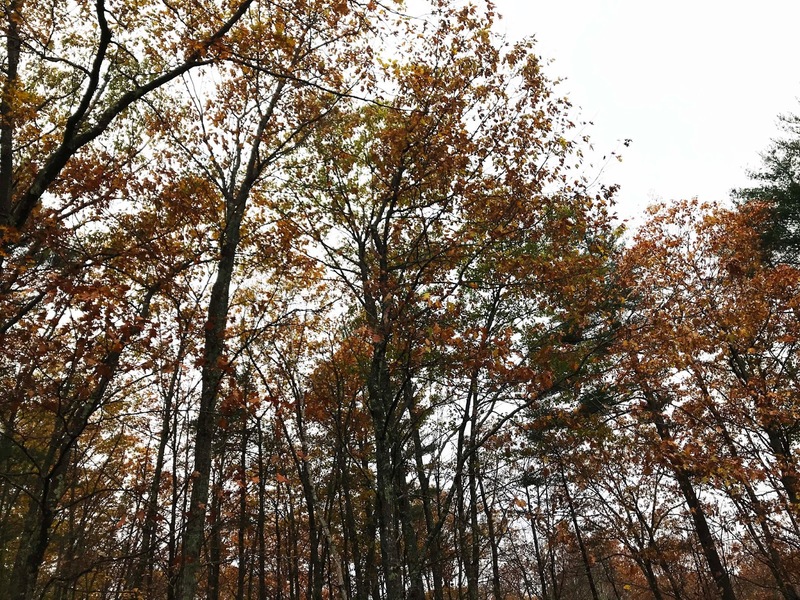 But you can see there are still lots of leaves on these oak trees around my house. I decided to rake the garden out anyhow so when the rest of the leaves come down I won't have quite as much raking. But the grass is still covered with leaves and the deck too. Never mind the twigs and leaves in the driveway. You can guess what I will be doing over the next few weeks. Hopefully, there's no early snow this year. 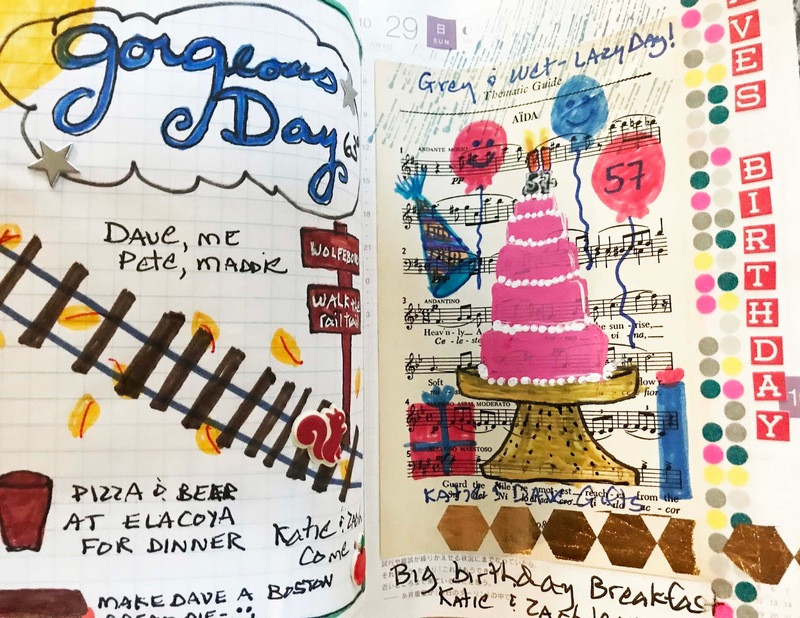 And I have a few pages from my drawing journal for you today. I really hate how the left side of my journal has such curve to it. Since each page is dated, I can't remove any. Good thing I have a new drawing journal for 2018 that just arrived from Amazon. (But that's my second scary thought in this post. Where does time go?) Next year I ordered a 2 journal set, six months for each one. Maybe that will fix this problem. I think it's time to work on depth and shadowing on my doodles. Now that I feel more confident that I can doodle most things I try to draw. And this weekend I will hopefully get some time to finish up all the half done art pieces I've been working on. They say rain Sunday so it sounds like I might since I can't do any raking. that storm was pretty wicked. 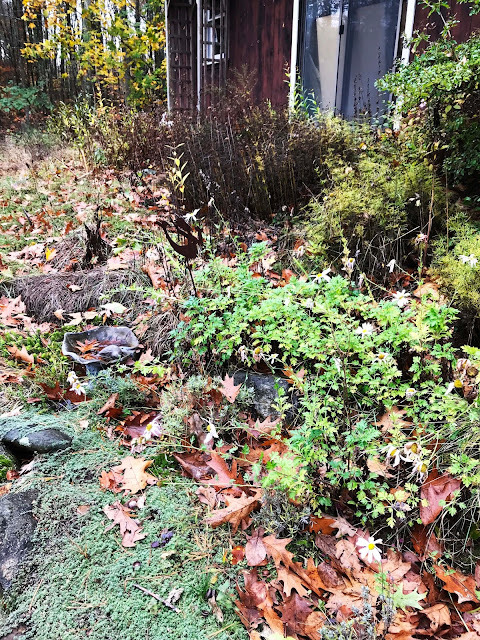 If it helps, I read an article from a horticultural society that said you shouldn't be so industrious raking up leaves and clearing the garden. The leaves provide food and shelter for little animals like chipmunks. Insect pupae use the leaves for protection while they grow. And the decomposing leaves provide nutrients to the soil. 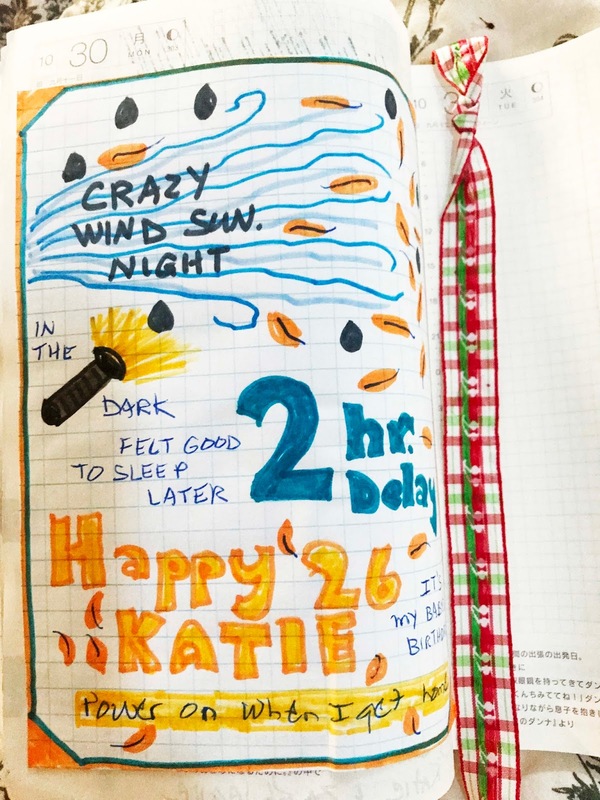 Your journal is so fun and colorful. Hard to believe this year is almost done. Where does the time go, indeed. 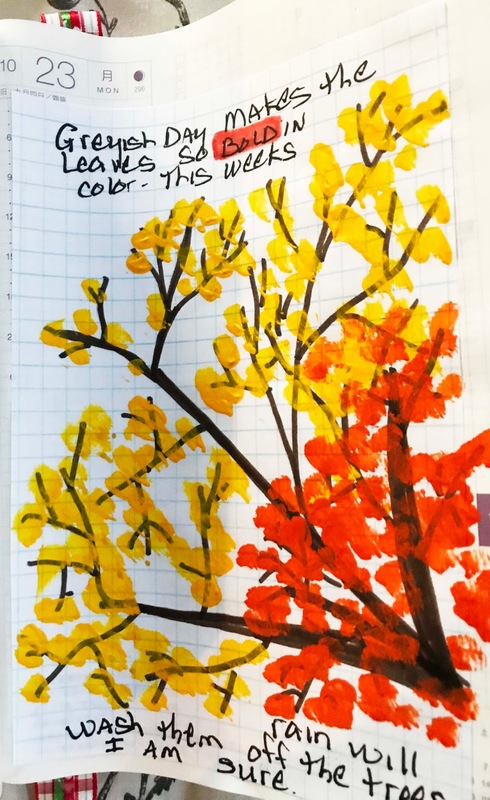 Your orange and yellow leaves on the journal page make me happy. Seeing this reminds me my tree guy is coming in 15 minutes and I'm still in my jammies. Gotta run! This puts my calendar to shame. Your doodles are fabulous, and I really like how well you draw. The cake is out of this world and I adore the use of the Chem test for a background. Your art is really great and I can see why you want to take it to the next level. Happy Friday. 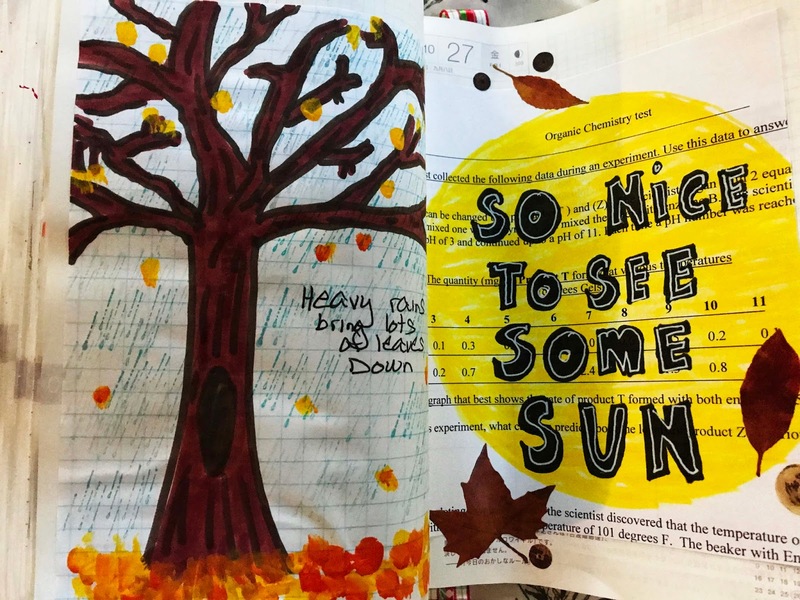 Looks like you've been working hard with real leaves and playing hard with doodled leaves! Your autumn pages look fabulous - I especially love those last glowing leaves hanging on to the branches on the greyish day. Your pages are always a pleasure to look at! Sounds like the leaves are overwhelming - lol. But it looks so nice organic...hihi! Good that the storm didn't cause more damage at all. I am happy that I have mown the lawn last weekend and got the most of the leaves into the mower... smart Susi! But I have for sure just a minimum amount of leaves compared to you! Happy weekend with arttime and relaxing hours for you Mrs.Nelson! No taxidriving this weekend - I am a lucky girl! How nice to rescue the ladybug (we call them ladybirds). 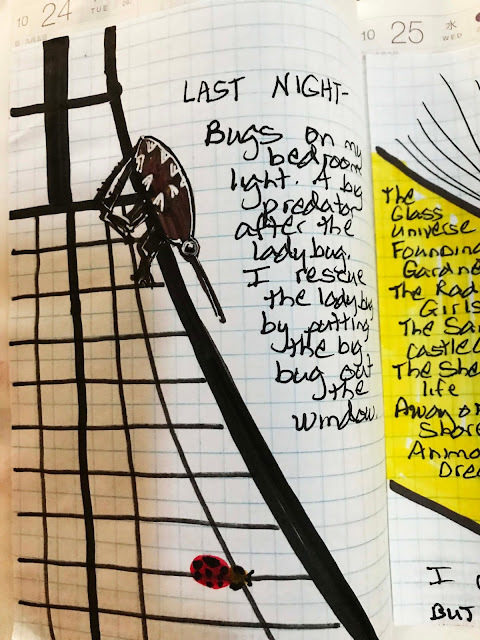 That's a fearsome Big Bug you've drawn, I'm glad it went out of the window quietly. If you ever find out where time goes, maybe you could let us know? It seems to be going faster for everyone. All the pages you shared from your journal look great Erika, you have added so many interesting images. With all the trees around your home it must be a never ending task with the leaves and branches falling in to your garden area. I dreamed last night that I raked all the fall leaves, and it was such a calming and peaceful dream. I have a tiny patio, though ;) I hope your raking and clearing can be finished before the snow comes. I admire folks who do the art journals. Your autumn leaves are "bold", and I love the colors!